When we moved to Sewanee with the intention of staying at least six months of the year, I had to cull my library here in New Iberia for favorites to take with me to The Mountain. Most of my books of poetry found a new home in Tennessee, but I left hundreds of other beloved volumes, some of which were passed on to me by my godparents who lived in Virginia most of their lives. Markham, my godfather, was Head of the Department of English and Foreign Languages at Virginia Polytechnic Institute, so I inherited anthologies of literature and books by the Elizabethan and Romantic poets. Dora, my second cousin and godmother, passed on several volumes of poetry written by friends of the family, among which were two volumes by Mary Leslie Newton. In another life when I took Communion to Sarah Helm of New Iberia (now deceased), I found we shared a mutual interest in the work of poet Mary Leslie Newton who had been Sarah’s headmistress at All Saints Episcopal School in Vicksburg, Mississippi and who had been Dean of the school when my godmother served as Assistant Dean. Sarah had never seen one of the small volumes I inherited from godmother, a green leather book measuring 3 ½” x 5 ½” entitled THE WINGS OF LONELINESS. 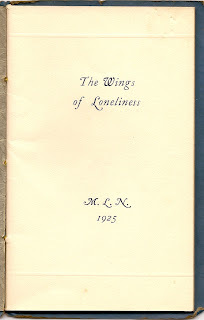 The volume, with its parchment frontispiece (still in good condition), was written in 1925 and contained twelve poems to coincide with the months of the year, each reflecting the theme of loneliness. On a flap torn from another of Newton’s books of poetry entitled A CROOKED STAFF, I learned that the poet had graduated from the University of Tennessee, and following her retirement from All Saints, she had moved to Chattanooga, Tennessee, a forty minute drive from my second home at Sewanee. She'd probably be judged as a “minor poet” in contemporary literary circles, but some of her work had appeared in the “New York Times,” the famed “Poetry” magazine, “The Lyric,” “Singing Mississippi,” and other publications. During WWII, Mary Newton was in great demand as a lecturer and conducted a class on current events during the war years. In addition to her work at All Saints, she taught at Noble Institute in Anniston, Alabama, Rowland Hall in Salt Lake City, Utah, and at St. Mary’s Hall in Dallas, Texas. When she attended the University of Tennessee, she produced so many publishable poems that she had to use several noms de plume for the school paper in which they appeared so the readers wouldn’t accuse of her monopolizing space. ‘Seems she was a minimalist in 1925 before the minimalist movement had gained momentum in the literary world. It’s nice to find such small treasures on my own bookshelves. After leaving Sewanee, Tennessee on Sunday, I returned to New Iberia, Louisiana Monday evening, expecting a Louisiana monsoon, and I was relieved to find sunshine and roads devoid of mud. Two days later, I am looking out my window at the sunny patio and hoping the weather will hold. October is usually a halcyon month in Louisiana, and I like Teche country in the late Fall when some of the sulk has gone out of the air and I wake up to crisp, clear mornings. After cleaning and tending yard for two days, I began “reading the shelves,” particularly the ones containing my Louisiana collection, and I dusted off several good titles about hurricanes before I unearthed a thin chapbook entitled SHORT MEET, the poetry of a younger friend of mine, Jeanne Bernard, who often shared dinner and literary conversation at my home on Front Street back in the 80's before she moved away – far away – to Paris, France where she met and married a Frenchman. Jeanne is the youngest of eight children born to Lewis and Catherine Bernard of New Iberia and has the distinction of carrying her grandmother’s unusual name as a middle name: Alaska. I’m not privy to the story about how Jeanne’s grandmother acquired such a distinctive name, but Jeanne often used the middle name because most people mispronounced her first name, she said , at the time of the publication of SHORT MEET. Today, I’m sure Parisians don’t have any difficulty giving it a proper French inflection. Jeanne wrote the slim volume of poems when she was working on her B.A. at Stephens College in Missouri. The booklet is No 227 of 300 copies and No. 4 in the Harbinger Chap Book Series published by Stephens College. It contains several poems that should resonate with native New Iberians, poems rich with imagery of south Louisiana. I always thought Jeanne would be the Poet Laureate of Louisiana one day. Actually, our wonderful Poet Laureate, Darrell Bourque, read at a poetry event at the Iberia Parish Library the same night Jeanne read from SHORT MEET, and I had the privilege of introducing both of them. One of the poems that I think is rich in Teche country imagery is entitled “At the Cemetery,” and I’m sharing it with readers because I want Jeanne to read it in a blog and remember that she’s a talented writer who needs to pick up her pen again! than a slab of granite in the cold grass. But it was noisy out. blaring in the next lot. and the city sewage stank. just before our grandmother died. and we brought no camellia for her. what I’d done with my flower. “You should have picked Pink Perfection,” she said. 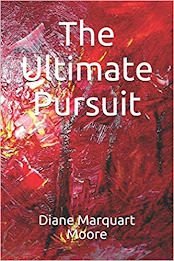 When Lori, my brother Paul’s wife, sent me another e-mail image of one of Paul’s recent paintings, still drying on the easel in his yard, I recognized the title of the painting, “The Forest Primeval,” as the first line of Longfellow’s famous poem “Evangeline” – a tale of “love in Acadie, home of the happy” (otherwise known as Nova Scotia). I love the light and the mystical scenery in Paul’s painting and feel that it must have been inspired by Paul’s knowledge of our Vincent ancestors who were expelled from “Acadie” during the Grand Derangement from Nova Scotia to Louisiana. According to noted Louisiana author Harnett Kane, the authentic story about Evangeline was passed along by the Mouton and Voorhies families in Acadiana and began with the grandmother of Judge Felix Voorhies. The grandmother had raised an orphan girl, Emmeline Labiche, in the Canadian home of the Acadians before the Grand Derangement. At sixteen, Emmeline was betrothed to Louis Arceaneux, and the marriage banns had already been published. The day before the marriage, Louis was injured and carried away; Emmeline collapsed, screaming for her lover. During the Grand Derangement, she and her guardian were taken aboard a ship and transported to Maryland. Emmeline thought that Louis would be there when she landed, but he couldn’t be found among the crowd of people who had been expelled from their homeland. After several years, the Acadians in Maryland heard about Louisiana, and Emmeline was among those who made a perilous voyage to St. Martinville in Teche country. When Emmeline stepped off the boat, she glimpsed Louis Arceneaux standing underneath a large, moss-laden live oak. However, when she reached out her arms to him, he turned away and said in a muffled voice that he had pledged himself to someone else. He had waited, but too much time had passed and he had asked another woman to marry him. From that day on, Emmeline’s manner became, in Kane’s words, “strange… alternating between melancholy and tremulous excitement.” She wandered along the banks of Bayou Teche, picking moss and flowers, weeping and talking about Acadie and of her marriage to be consummated the next week. She would talk about Louis being killed by soldiers and often asked people what would become of her. Her health deteriorated and she died, still believing that she would reunite with Louis. Longfellow heard about this romantic story that took place in Teche country and was intrigued with it. Actually, he had heard the tale from Nathaniel Hawthorne when they shared breakfast together one morning. Longfellow told Hawthorne he wanted to write about this “idyll in hexameter,” and Hawthorne agreed that the poet could use the story. Longfellow had never been in Louisiana, but he read histories, studied pictures, and corresponded with people who knew about St. Martinville. Longfellow was then teaching at Harvard, and a student of his who was a St. Martinville native, corroborated the story told by the Voorhies family. Longfellow began to create his epic poem and was surprised when it was published and circulated widely throughout the U.S. The Longfellow story differs from the Voorhies account in that Louis (who is Gabriel in the poem) didn’t forget his Emmeline (Evangeline). In the poem, Evangeline arrived in Louisiana, as did the real-life Emmeline, but she wandered throughout the countryside, searching for Gabriel and found him, dying in a hospital far from Teche country. The story about this romantic pair became so popular that a statue of Emmeline was placed on her tombstone near St. Martin de Tours Catholic Church in St. Martinville, and the huge oak beside the bayou in that town has been commemorated as the place where Evangeline found Gabriel. This story has gained much prominence in the U.S., and people in Louisiana often refer to St. Martinville and environs as “Evangeline Country,” scene of “the forest primeval” depicted in Paul’s beautiful painting. Some citizens of the Queen City on the Teche, New Iberia, Louisiana, refer to it as “The Berry,” derived from Iberia, and I often use it myself. On Sunday we’ll begin traveling toward that destination, and this morning I got up thinking about the town where I lived for over 40 years before migrating to Sewanee, Tennessee to enjoy cooler summers. Two years ago, I wrote and published a young adult book about the Spanish settlement of New Iberia entitled FLOOD ON THE RIO TECHE, a book that required a year of intense research about this settlement. Of course, I couldn’t include all the legends, facts, and historical accounts about New Iberia in the fictionalized young adult book that I wrote, but I discovered many interesting tales in Maurine Bergerie’s THEY TASTED BAYOU WATER, a history of New Iberia that covers its settlement and growth until the 1950’s. One of the stories she relates is about the area of town known as Camellia Subdivision where I presently have a home, an area so named because of the myriad varieties of camellias that grow in most yards of the subdivision. It seems that after the Spanish settlers fled a flooded site near Charenton, Louisiana, they came up the Teche in large flat boats, propelled by long oars or sweeps. When they reached a bend in the bayou that begins near Camellia Subdivision, which is the upper limits of New Iberia, some of the settlers debarked and climbed tall oaks that abound in the area. They made camp a short distance from the Teche and remained there for several days. This area was the original site for Nueva Iberia, according to Bergerie, and not the site uptown at Bouligny’s Square that has been identified as the place where settlers came ashore. Supposedly, their camp was under a large live oak that stood at the point where Darby Lane and the highway to St. Martinville intersect. That oak remained in the center of the highway until the road was surfaced. So, I live approximately a half mile from the site where original settlers set up camp for a settlement in Nueva Iberia! Flax and hemp provided the livelihood for these early settlers, but these crops soon failed, and the families turned to raising cattle. At that time, raising stock resulted in the production of a beef carcass weighing in at 700 or 800 pounds that sold for the grand price of $4. Part of the story I wrote about FLOOD ON THE RIO TECHE involves the Romero family turning to raising cattle after failing with agricultural crops. Those first settlers struggled to remain in Teche country, and following the first Spanish migrations to Nueva Iberia, only 190 people lived in the Queen City on the Teche. Through the years, sugarcane and oil have increased the fortunes of those who live near the banks of the Bayou Teche, and the town now has a population of 32,000. It’s just large enough for people like me who prefer small cities. New Iberia is a town where you see the names Thibodaux, Broussard, Poirier, Romero, Migues, Lopez, Segura, DeBlanc, etc. in the telephone directory – Spanish names interspersed with French, and also German, English, and Scots names. However, New Iberia’s European flavor is derived primarily from the descendants of the Spanish and French, a colorful intermingling that contributes to a rich culture. The Queen City just celebrated its annual Gumbo Cook-off, an event that brings in chefs from throughout Louisiana and other parts of the country, who compete to produce the most flavorful gumbo – chicken and sausage gumbo, seafood gumbo… Judges evaluate the gumbo for consistency, color, and taste. A chapter in another of the young adult books I’ve written (THE KAJUN KWEEN) entitled “Great Bowls of Gumbo” describes this event. 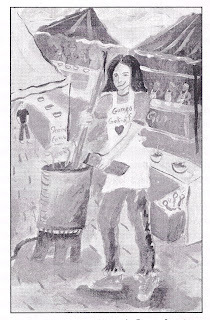 The illustration by Paul Schexnayder at the beginning of this blog announces the chapter about the gumbo cook-off in THE KAJUN KWEEN. So “hay la bas,” I’m headed toward the Queen City on the Teche and am wondering what chapters for new books “The Berry” will inspire during my winter sojourn there. Yesterday, my sister-in-law Lori sent me one of my brother Paul’s latest paintings. 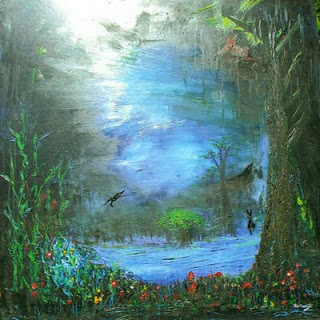 Despite glaucoma and fading eyesight, Paul has resumed painting apace and has rendered some arresting work lately. A friend of Paul, who is a native American from northern California where Paul lives, often brings Paul fresh salmon as he and Lori enjoy grilling this appetizing fish. I think Paul must have developed an interest in the friend’s background, particularly the history of the exodus of native Americans from that area when Europeans drove them off their land. The painting above depicts native Americans leaving their homes and carries a powerful message of this expulsion. It reminded me of the sad exodus of Acadians who were expelled from Nova Scotia and settled in my native Louisiana, including our Vincent ancestors who were part of this forced migration. The painting prompted me to investigate the occupation and exodus of the northern California tribes, and I uncovered a familiar story about native Americans being removed from their homes and massacred. Remnants of these native Americans also battled with the government for legal rights, and that battle continues even today. Approximately five percent of the population of the town on the redwood coast where Paul lives are native Americans. Their ancestors were members of tribes that occupied the territory thousands of years before white man invaded and include the Tolowa and Yurok tribes. The Tolowa tribes believed that the homes they built of the fallen redwoods formed a spiritual habitat since the redwoods were spiritual beings that pre-dated human beings and actually taught humans how to live. During the Red Cap War, Yurok and other native tribes in the northern California area moved to the Hoopa Valley Reservation. Unlike the Chitimacha in my native Louisiana, who live near Charenton, Louisiana, they have preserved their languages, including Yurok and Hoopa dialects. Many of these native Americans are commercial fishermen and deliver groundfish, salmon, mackerel, albacore, and shrimp to the redwood coastal area. The abundance of fish delights Paul who was an avid fisherman and who has a bona fide Cajun appetite for fresh seafood. I can visualize him conversing with the native American who brought him the salmon and ferreting out information about the man’s family and occupation. Paul is a Greenlaw to the core in that he’s garrulous and friendly to everyone he meets. I surmise that some of his encounters have inspired other paintings in his repertoire. In addition to the fishing industry, Paul must feel at home in northern California because the area once boasted a large lumber industry, and our grandfather Paul and Great-Uncle Ed were heavily engaged in this industry in Louisiana during the early 1900’s. The lumber industry in northern California declined during the mid 1900’s because, by 1960, almost all of the original, great redwoods were gone. However, due to efforts to conserve them, the Redwood National Park now offers tourists a view of these magnificent trees, some of which surround Paul and Lori’s home. I hope you enjoy the painting. Paul’s love of and use of color has intensified during his seventh decade, and I fully understand his appreciation of bright hues and his impetus to capture the vivid colors of Creation. This morning I preached the last sermon I’ll preach at St. Mary’s before we wing off to Louisiana again, and I felt a distinct catch in my throat as I stood on the altar, assisting Sr. Julian at the Eucharist. We owe so much to the kindness and hospitality of the Sisters of St. Mary who “took us in” the first summer we moved to Sewanee. Following the service, my friend, Rick Sommer, talked with me about retirement and how he had heard a lecture on the subject that helped him make his own adjustment to life after leaving the work force. The lecturer informed retirees that a two-year adjustment period would be necessary before most of them would feel comfortable with themselves and their new environment, if they moved to a place that had not been home to them. My response to Rick was that the Sisters at St. Mary had, by virtue of their presence and hospitality, eased me into my adaptation to retirement at Sewanee. when I look within while traveling out. carelessly tossed on my bedside table. into the poems they are. all defining passages in my life. what will the chapter of this new exodus be? Now that I am preparing to leave The Mountain again and we have been socked in for days, I ponder things I will miss when we have said goodbye to the summer retreat. A few days ago, I thought that I’d be happy to leave and wouldn’t be having nostalgia for anything up here. It was the day we discovered a critter in our garage. I had gone out to put garbage in the containers standing in a corner of the garage and noticed a sack of mulch with a hole in its side, the mulch spilling out untidily on the garage floor. I called to my friend, Vickie, and she came out to view the destruction. She picked up the sack, not so gingerly, and a black nose and two eyes stared up at her. It was a skunk, and how we were saved from a colossal spray, I don’t know. Sister Skunk emitted a faint odor, and we raised the garage doors, by hand, in record time. Surely, we thought, she’ll scamper back to her nest somewhere far from our premises. Later that evening, as I was talking with a friend on the telephone, I heard a sound as if a body was being thrown against the garage wall. The friend could hear it via the telephone. I knew what it was – not a robber, but a marauder with a strong scent – the skunk! She was trying to get out. However, later we peered into a corner where approximately eight pieces of luggage were stored, and there she was, curled up in a space between the luggage and the platform on which it stood. Again, we opened the doors, but at bedtime when I peeked out, those eyes were still peering at me from the corner. I went to sleep on the thought that the Department of Wildlife would have to be called the following morning. We’re accustomed to seeing much wildlife here on The Mountain, but I wasn’t going to spend the rest of my sojourn here with a skunk in residence. 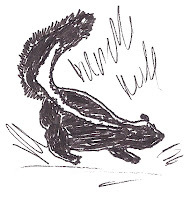 Unlike my favorite children’s artist, Beatrix Potter, I find nothing enchanting about Sister Skunk. who could take me to the Other Side. she had dug in the undulating lawn. fleeing from each other’s strange scent. Peter Pan was a primitive-style camp, a complex of one large, pinewood building and two smaller ones, an outhouse, and a hand pump on a small concrete slab that provided clear, cold water when we pumped it hard enough to produce a hearty stream. My Grandfather Paul had wired the camp for the first radio in Washington parish in the early 1900’s, but the radio was off-limits to the Friday crowd and played only for Girl Scout camp sessions. On these Fridays of respite from hot weather, we usually met at a small stone building called “The Waverly House,” departing exactly at 8 a.m. for Peter Pan. Once we reached camp, someone was recruited to run up the flag (it was usually one of the delinquents who spent a lot of time in the local pool hall who volunteered for this job), and we had “Colors” which consisted of recitations of the Pledge of Allegiance, the Lord’s Prayer, Bible readings, and meditations from Mrs. Love’s “Expression Book.” Her “Expression Book” was a composition book with marbled black and white cover that contained poems, quotations, and excerpts from literary classics. The “Expression Book” was one of many composition books Mrs. Love used to teach “Expression,” a class that focused on elocution, poetry recitations, and bible verse memorizations. Mrs. Love turned out many lawyers and several judges who graduated from her Expression classes, and later, as an adult, I discovered that the classes had been her only means of making a living. Hallie C. Love probably didn’t realize that she influenced many lives so profoundly with her love and service. In fact, few of us ever actually see the successes of our efforts to change the world, nor are we usually publicly acknowledged for our lifelong commitments, but I believe that Hallie Love should be among those who’re acknowledged for “ubuntu,” a South African word that translates: “A person is a person because of other people.” Many times we’re brought into “presence” by the seeing and serving of some other person who loves us and lives out that love…as Hallie C. Love did with her band of young people growing up in one of America’s small southern towns during the mid 20th century. In August, 1947, when our family ended a gypsy summer on an odyssey to “Diddy Wah Diddy” (California to readers), we returned to my mother’s home town and the place of my birth, Franklinton, Louisiana. Franklinton, a piney woods village of approximately 2,000 people in southeast Louisiana, wasn’t the paradise in which my father expected to gypsy when he sold most of our possessions, bought a small gray utility trailer and filled it with camping equipment, then settled us in a 1941 blue Ford coupe bound for “Diddy Wah Diddy.” We were a family of four children two adults, and TeeNap, a cocker spaniel who lay at my feet on the entire journey West. My father had declared that we ‘d be gypsies forever, a declaration that filled my heart with terror, for I could hear all the school and library doors in the world clanging shut against me and felt that I’d never sleep in a real bed or take a bath in a porcelain tub again. When my Grandfather Paul found us camping out in Burnet, Texas, he asked my dad to come home to Franklinton to help him run the Ford business that Grandfather had established in the days of Model T’s. Actually, my dad didn’t turn the coupe around and head back to Franklinton until we reached Los Angeles. When he turned east, then southward, I felt deeply relieved to be returning to civilization. That was the year Hallie C. Love came into my life. Perhaps my memory of her is so vivid because she became a stabilizing influence for me after the unsettling gypsy odyssey West. Before “Diddy Wah Diddy,” I had spent wonderful summers with my grandparents in the old white frame house with its Victorian cupola on 10th Avenue in Franklinton. The silence of the old house had been heaven to me since the rest of the year I was surrounded at home in Baton Rouge, Louisiana by three noisy, quarrelsome siblings. In my grandparent’s home, I spent hours on the sleeping porch at naptime, reading “The Little Colonel” series and didn’t give much thought to outdoor activities. However, the first week after we moved to Franklinton, my mother sent me on a hike with Mrs. Love. A stocky woman in her sixties, Mrs. Love wore her untidy gray hair in a loose bun and her weathered face sans make-up. She led a group of Girl Scouts down to Miles Branch, approximately two miles from town, and in the pine-scented air, marching along with other giggling girls behind this Pied Piperess of youth, I felt as though I had entered a world of adventure that, unlike the “Diddy Wah Diddy” trek, was SAFE. Mrs. Love loved the outdoors, camping, and, above all, Girl Scouting, but she appeared to have better sense than to sell all of her possessions and take up the life of a gypsy as my father had proposed to do. Her father, Mr. Cozine, was an advocate of Boy Scouting, and he revered Lord Baden Powell, its founder, but Hallie Love revered Juliette Lowe, the founder of Girl Scouting, and she established the first Girl Scout troops in Franklinton during the early 1900’s. I never saw Mrs. Love wearing any dress other than the tattered green cotton leader uniform of the 40’s, cinched at the waist with a Scout belt and buckle, from which dangled a silver whistle like the one Juliette Low used when she put her patrols through the paces of marching to raise money for war bonds or instructed them to make formation for outdoor activities. Mrs. Love had been my mother’s Girl Scout leader and had inspired my mother to work toward the Golden Eaglet award, the equivalent of the Boy Golden Eagle award in the early days of the 20th century. Under Mrs. Love’s tutelage, my mother and several others worked on a myriad of badges that were sewn on the sleeves of an old khaki uniform I later donated to the New Orleans Girl Scout Council. She achieved this high honor during a time when Golden Eaglets were few in number in the U.S. Sadly, she didn’t live to see me become an executive director for Bayou Girl Scout Council in Lafayette, Louisiana, but if I had to trace the origins of one of my former careers, that of an executive in Girl Scouting, it would be to this Golden Eaglet scout and to “Mother Love,” as we called her. Mrs. Love not only shepherded Girl Scouts for 50 years, culminating with her death in the 1960’s, she was coordinator of the Friday Club, a group of youth, delinquent and otherwise, that she rounded up every Friday during humid Louisiana summers for a day of swimming, picnicking, and hiking at Peter Pan, the Girl Scout camp about ten miles from town. Those of us who belonged to this club would squeeze into an old wooden-sided, long-bedded truck with open(!) tailgate owned by Uncle Zeke Babington, local hardware store proprietor. The old truck was driven by “Tin,” a toothless black man with a wide smile and high tolerance for the delinquent members of the group who’d hang their feet over the tailgate as we sped toward Peter Pan. Mrs. Love rode in the front seat with “Tin” and never looked back at us, practicing, I supposed, “what you don’t know won’t hurt you.” Our ages ranged from 7-16, and we weren’t divisible by age, older children buddying with younger ones in couples because that was the way Girl Scouts took care of one another, Mrs. Love told us. Note: Part II of LOVE WAS HER NAME will appear in a successive blog. For the past two years, I’ve been involved with a project to provide clean water for Haiti through the Sisters of St. Mary who take medical supplies and other aid, including a water purification system, to an orphanage in Port au Prince. The orphanage is called the Faith, Hope, and Love Infant Rescue Home, and its mission is focused on sick and dying children whose parents are unable to take care of them because of extreme poverty. My work with the project has been as a fundraiser for the water purification project, and I’m happy to report that my Bishop, the Rt. Rev. Bruce MacPherson, has made a sizable donation for the years in which I’ve been involved. In the Spring of 2010, the Sisters and missioners from other denominations will again visit Port au Prince to take a water purification system and medical supplies to the orphanage, and to lend aid with the children as needed. Last year, Barbara Hughes, a fellow member of the congregation that worships at St. Mary’s Convent, accompanied the Sisters to Port au Prince. Barbara, a consummate artist and teacher at the Sewanee Theological Seminary, went along to help tend the children and to engage in their play time. She and the children did a lot of splashing paints on large sheets of paper together, and she fell in love with “the little ones of Haiti,” as she called them. 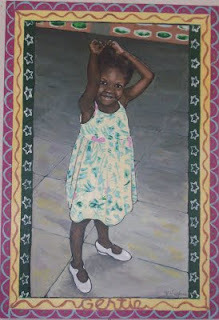 When Barbara returned to Sewanee, she decided to “celebrate their personhood” by painting portraits of some of the children from photographs she had taken. The paintings, in bright acrylics on wood, reflect Barbara’s love of the orphans she encountered, and I’m including photos of several of the portraits. The borders of the paintings were inspired by the colorful designs on “tap-taps” (taxis) and buses, and by the vibrant art in Haiti… as well as by the hopeful spirits of the children. 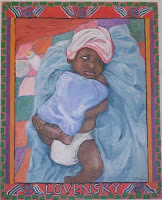 Sunday, Barbara exhibited the Haiti paintings at Shenanigan’s here in Sewanee, and I selected those portraits that particularly “spoke to the condition” of these orphans. My favorite painting was that of “Gertie,” a cheerful-looking child wearing a pair of used tap shoes. It seems that one day a package arrived at the orphanage, and the children grabbed them and hurried to the rooftop to dance. Gertie was on the spot to get her pair of white tap shoes, and Barbara painted a portrait of her grinning, looking as though she could hardly stand still in the used shoes. Gertie, five years old, speaks Creole and English, and her health has so improved that she’s able to return to her parents in her native village. 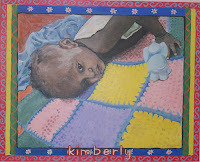 Kimberly was sent to the orphanage shortly after her first birthday as her family was too poor to give her proper nutrition, but she was restored to health by August, 2009 and also returned to her family. The exhibit included more portraits of these Haitian children, along with some of Barbara’s sculptures, but I selected only a few paintings to feature in this blog. While the lovely art exemplifies the personalities of the children, it reveals the personality of this gentle, gifted artist who, each summer, travels the world on missions with her husband, Bob, a priest who teaches at the seminary. Barbara also teaches a course on healing through art. ANOTHER NORTH CAROLINA TREK, Part II. From the hotel window in Asheville, I look out at a line of forest green mountains, then charcoal, then lighter gray peaks over which three gray clouds float. A group of foolhardy houses perch at the top of the forested mountain, almost touching the dull October sky. The parking lot has emptied by early morning, and we seem to be the only occupants of the hotel. Rain is predicted but we venture downtown to an art gallery, a two-story building formerly housing Woolworth’s five and dime store, touted to hold the work of the finest artists in the region. A developer from Miami bought and transformed the building, and as we enter, we see the old soda fountain where people, sitting on red-cushioned stools, make short orders at its long silver and red counter. A t-shirt hanging at the entrance to the gallery advertises “Asheville: where normal is weird,” and the art is certainly varied, ranging from garish and whimsical to excellent scenery art. Placards placed by each booth tell the story, over and over again, of artists who gave up good jobs and moved to Asheville to be a part of the art scene. A display of cigar-box fiddles, prices ranging from $375 up, features a news article about a former computer network engineer who moved to Asheville to take up the art of fiddle making. I entertained myself by imagining some of the art work as covers for future books, especially a monotype of “Fall Electricity” that reminded me of the wonderful ride up. At the Malaprop’s Bookstore and Cafe we discovered that a women’s group meets for poetry readings there and had just presented “Souvenirs of the Shrunken World’ by Holly Iglesias, billed as a poet who believes that”small things make history real.” Brian Lee Knopp, Jill McCorkle, and other noteworthies are slated to read at Malaprop’s this month. The Thomas Wolfe production on Friday featured an actress from my home state of Louisiana, Tiffany Cade of Lafayette, Louisiana, who played Lola Love in “Return of the Angel.” The Occasional Theatre productions are committed to nurturing North Carolina writers, and the “Return of the Angel,” written by Asheville native, Sandra Mason, came off as a highly professional drama. The play took place between 1928-1937 in New York City and Asheville and highlighted Wolfe’s struggles as a writer, as well as the derision he endured both from the literary world and family and friends because of his autobiographical characterizations of people in Asheville. Nothing equals a car trip in the Fall when leaves are beginning to turn yellow and red, trees in the Appalachian range ablaze with life before they fall to the ground of winter. Fall moves in, trailing a shower of leaves; its sky a porcelain blue. 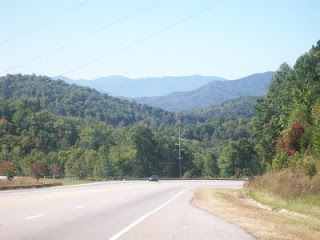 Thursday, we set out from Sewanee, TN for Asheville, NC and the 80th celebration of Thomas Wolfe’s LOOK HOMEWARD ANGEL. We traveled the Hwy. 64/74 route which took us through Ocoee and the Cherokee National Forest, alongside strong rushing water created by the TVA Dam. Creeks along the way bore strange names; e.g., Goforth Creek, which we surmised must have been baptismal waters for fundamentalist sects scattered throughout the mountains. The creek named Brush Creek was entirely that –dense brush that had overtaken a dry stream bed. 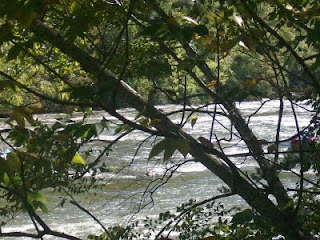 River birch, sweet gum, sycamore, and jack pines followed the water and stood sentinel by streams and rivers we passed. The sun was out, the air crisp and fine. It was a perfect day to make a trek through woods and water. offending her scale of joy. Traveling through the Fall scenery in the TN and NC mountains, I felt inspired by the light about which I had written early that morning. I also felt a tug to backtrack when the ride ended and we entered the City of Asheville, lured on by the celebration honoring the 80th anniversary of Thomas Wolfe’s masterpiece, LOOK HOMEWARD ANGEL. The celebration featured an Occasional Theatre Production entitled “Return of an Angel, written by Sandra Mason and directed by Michael Lilly. We had come a long way (six hours) to view a two-hour drama, but it was worth the scenic drive. Asheville has many places where good books, author readings, music and gallery events draw us over the mountains into a metropolis that features the best of Appalachia. Note: The second part of the North Carolina trek follows in a succeeding blog.